At the weekend under ivory skies we strode through the whisper quiet and ghostly snow-swept landscape of rural Berkshire. The pastoral scenes were framed by a myriad of plants dusted with gossamer flakes. It occurred to me as we rambled that I have been away from this journal for longer than I care to admit. Sadly due to an extended absence as a result of chronic RSI and tendon problems, the world of writing has been beyond my feeble grasp. Thankfully I’ve had the opportunity as part of my move from seaside Sussex to leafy Berkshire to engage in much idle perambulation through winding country lanes and digestion of numerous library books with only soaring red kites for company. In my digital absence the diverse aspects of landscape, psychogeography and wanderlust apparently have continued to be rather fashionable. Robert Macfarlane’s excellent book The Old Ways which narrates his travels along the ancient holloways of Great Britain rode high on the summer best seller charts and the BBC dissected the tangled city of London with superb socio-historical analysis in The Secret History Of Our Streets as part of their Olympic arts schedule. We walked along the edges of expansive farmland gently blanketed with luminous crystal shards, eagerly spying the numerous zig-zag paths left by departed wildlife which had foraged in the bitter chill. 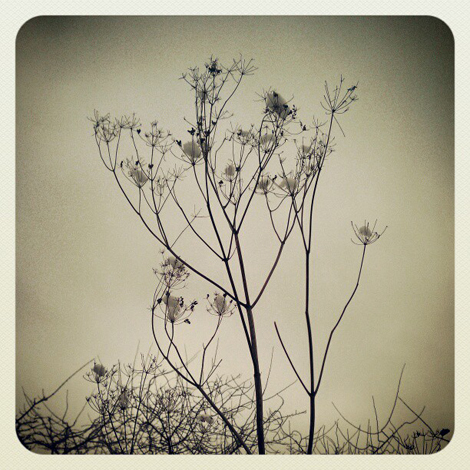 The patterns and narratives were curiously stark, dark lines had been subtly imprinted upon the frosty geography. Macfarlane in The Old Ways observed on his winter treks that ‘the snow was overwhelmingly legible, each print trail seemed like a plot that could be read backwards in time; a series of illusions to events since ended’. The footsteps carefully marked out the seasonal nature, vibrant and yet obscured. We paused at the tiny ruined church in the silent hamlet outside of Arborfield as the thickening snow caressed our faces. Here the fractal shapes lay heavy in the stillness embracing the stonework and gnarled tree-trunks, rendering the landscape as frail bone. The harsh intersection of architecture and organic forms reminded me of one of my favourite albums, Vespertine by Björk. It is a majestic and glacial mesh of digital glitch and analogue orchestral bliss, the songs echoing an otherworldly aching, the bitter weather reworking our soft environment anew. 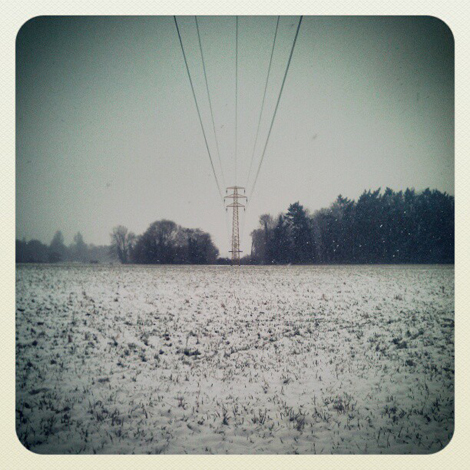 The shimmering sounds allude to drifting icebergs, snow crunching under tentative feet and decaying electronic memories. When describing the work she said ‘a word that helped me a lot making this record was “hibernation.” being internal is a form of hibernation, and I related it to winter, the sound of crystals in wintertime. that’s what I wanted this album to sound like.’ Vespertine presents us with an amniotic realm, wrapping bodies in the lethal caress of Mother Arctic’s icy cocoon. Macfarlane, however, in the Old Ways instead gazes outwards, documenting the ancient footpaths and opening up these veiled passages, unfurling knotted hedgerows and drover’s lines for us all to consider. As we ventured further the landscape became punctuated by skeletal pylons which neatly contrasted the man-made with the older root and branch, these power lines traced newer pathways far above the folds worn by gentle rabbit and deer. Vespertine’s binary static bliss thus arced high above the wayfarers of Macfarlane’s work. This is the epic deep time of nature played against the staccato immediacy of the modern world. At one point we paused and in a moment of whimsy I placed a huge icicle into a frozen pool, its new form recalled a Tolkien-esque wraith weapon or noble Arthurian lance. It was a crude gesture towards the mighty work of nature artist Andy Goldworthy, celebrating the fragile impermanence of this bleak winter-scape which ranged about us for a brief moment. The transparent slender cone was a light hearted ephemeral marker for our ramble, one that will melt in the inevitable sunshine. As the daylight began to dim and the spectral mists closed in we finally set back towards our home. Macfarlane points out a rather beautiful quote by Tim Ingold and Jo Lee Vergunst in his book which seemed somehow appropriate. They wrote ‘since to follow a trail is to remember how it goes, making one’s way in the present is itself a recollection of the past, onward movement is itself a return. Walking is both an act of meditation and healing, thus a reflective and transformative activity. The journey on winter’s coldest day underpinned my slow recovery and signalled a freshly determined return to a more productive self. That last piccie is quite unique – that’s the one that says what you’re saying in a Chinese way. Thank you! 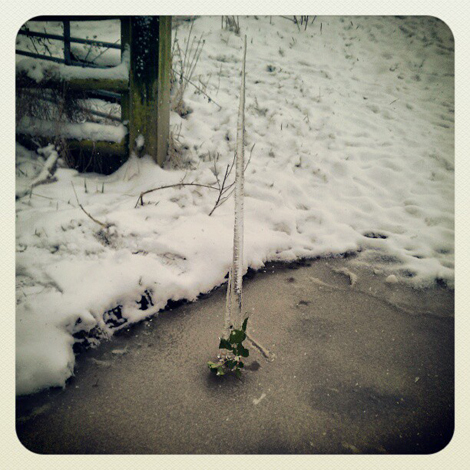 The icicle made for a suitable spear or marker, both humorous and weird! Welcome back Matt and good to see you in top form. It is quite magical how something as transient and ephemeral as snow can transform our surroundings and make the world strange. Thanks very kind, it feel like I’ve been away forever and the winter otherworldliness felt like an appropriate point to change! Matt – I’m embarrassed to say this is the first time I’ve read your blog – seems I’ve been missing out on something quite special. I loved reading this and hope as spring kick starts our emergence from hibernation it also brings with it a continued recovery. Very kind, I look forward to spring too, a chance to look at things anew! Worth the wait Matt – just beautiful, words and images. I’m glad you have been able to devote yourself to reading and walking anyway – Every cloud…. Thanks. Yes, it has certainly given me a chance to pause, walk and think. Great to see you blogging again, Matt. I love the gravity-defying quality of the last picture. Thanks, very kind, just thoughts really, strung together in a rambling manner! Winter is a good time to catch your breath.